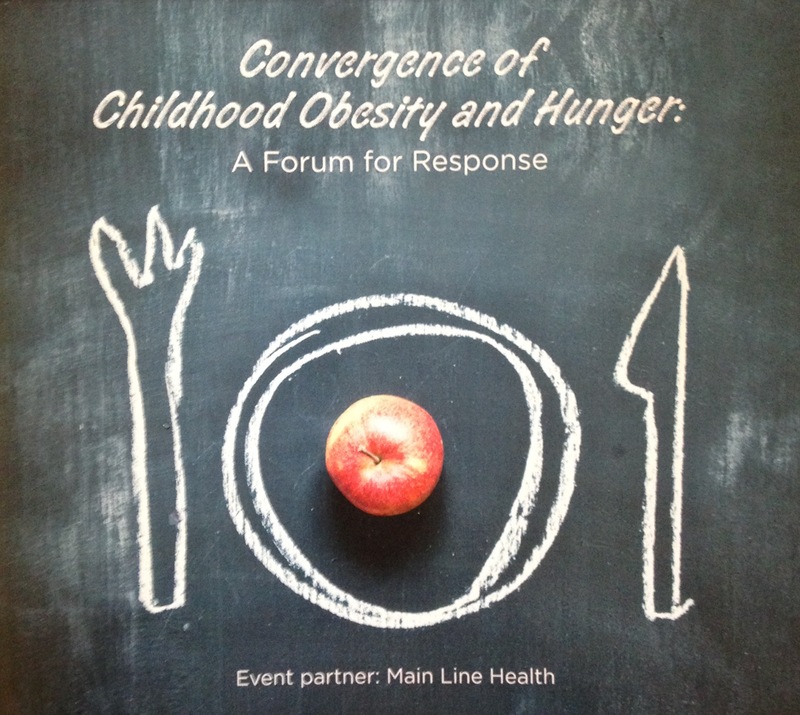 Great work by Maria Elena Hallion at Cabrini College in organizing an impactful one-day symposium last month on the convergence of childhood hunger and obesity. I was pleased to participate in this very timely event along with experts such as Dr. Sandy Hassink (President of the American Academy of Pediatrics), Dr. Sol Katz (a food system expert from the University of Pennsylvania), Eric Mitchell (Director of Government Relations for Bread for the World), and Mary Pat Raimondi (VP of Strategic Policy & Partnerships at the Academy of Nutrition and Dietetics) — along with many enthusiastic students and leaders from the non-profit sector. Globally, we have over 800 million hungry individuals, and roughly two billion suffering from micronutrient deficiencies. In the U.S., we have nearly fifty million food-insecure individuals — roughly one-third of whom are children. Yet at the same time, we waste tremendous amounts of food. A recent study by the Institute of Mechanical Engineers estimates that between 30% and 50% of all food produced around the world is lost prior to human consumption, which ranges between 1.2 and 2 billion tons. In the U.S. alone, USDA’s most recent report estimates that 31% of the available food supply goes to waste — about 133 billion pounds (at a value of $162 billion). Clearly, we waste a lot of food across the globe in all food categories. At the same time, hunger coexists with obesity due to a lack of food, as well as a lack of access to good, nutritious food. The lack of access to high-quality calories in fresh fruits and vegetables is of particular concern. The World Health Organization notes that obesity has more than doubled since 1980 and is impacting millions of young children. The Food Research and Action Center (FRAC) reports that one-third of U.S. adults and 17% of U.S. children are obese, while a recent study by the McKinsey Global Institute notes that 30% of the world’s population is now overweight or obese (with that figure soon to be 50%). Significantly, McKinsey ranks obesity as one of the top three social burdens created by man (ranking only behind smoking and armed conflict). Also highly significant is the potential for declining life expectancy among the current generation of U.S. children due to obesity-related health issues. In other words, despite all of our technological advances, our children face shorter life spans due largely to poor health stemming from inadequate nourishment. These points are applicable (and linked) to the problem of food waste as well. We need to take a systemic approach to food waste, and we need the participation of all key stakeholders in reducing it. A starting point involves viewing the vast amount of food that we waste across the globe each year as a tremendous opportunity. Capturing and redirecting high-quality calories in food that is currently going to waste can help us reduce hunger, improve nutrition, and reduce obesity and diet-related illness. It can also allow us to improve the environment, enhance our sense of community, improve security, and save money. On the financial front alone, the CDC estimates that the annual medical costs associated with obesity total $147 billion. Rather than continuing to pour limited funds into back-end treatments, we would be much better off working on up-front prevention strategies which route healthy food to people versus landfills. We need to view wasted food as the low-hanging fruit to mitigate hunger and obesity. Doing so requires culture change — shifting away from the culture of abundance which allows us to discard such vast amounts of extra food at all levels of the supply chain — and implementing steps to put that food to higher value use. Individuals can (and must) play a leading role in this change, working in conjunction with retailers, manufacturers, and growers to make use of slightly blemished/odd-sized (i.e. “imperfect”) produce items. Legislators can provide clarity on confusing “sell-by” terminology while providing incentives to safely redistribute excess food rather than discarding it to landfills. Retailers can challenge accepted levels of waste and actively work to repurpose food items that are currently discarded. They can push change through the supply chain by challenging suppliers to do the same. Growers can seek partnerships with food recovery operations such as the Society of St. Andrew to aggressively redistribute the vast quantities of fresh fruits and vegetables that do not make it to market for myriad reasons (size, shape, shelf life, market conditions, etc.). As noted at The Last Food Mile conference in Philadelphia, opportunities exist at all levels of the supply chain to reduce food waste and to redirect excess food to good use. Feeding people tops the list, and providing high-quality calories which can reduce obesity and diet-related illness is a “win” for all of us. In my mind, the “convergence” of hunger and obesity also includes excess food (aka food waste). Check out Cabrini College’s event page here, view the topics, and get involved in this critical conversation with significant social, environmental, and financial implications.